Who doesn’t like sitting in front of the television and popping in grapes? Well, I certainly do! Grapes not only taste amazing but also are extremely nutritious. They are mood-boosting agents and great for our health. From diabetes to cancer, grapes can be used as an effective treatment – and that too, without any side effects! 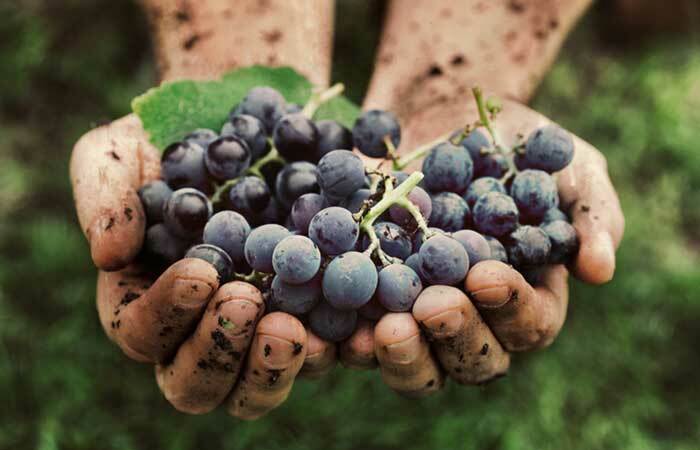 Want to know more about grapes and the beauty and health benefits they provide? Just read on, I’m sure you will be surprised by many of these facts. Other Names- Angoor (Hindi), Draksha Pandu (Telugu), Draksha Pazham (Tamil), Munthiri (Malayalam), Drakshi (Kannada), Dhraksh (Gujarati), and Draksha (Marathi). Grapes are known as ‘The Queen of Fruits’, and are categorized into three variants based on their color – red, green, and black/blue. This wonderful and flavorful fruit not only adds vibrance and appeal to your food, but is also very beneficial. Grapes contain immunity-boosting vitamin C, simple sugars that provide instant energy, and antioxidants that are anti-inflammatory. Just wow! Grapes are an elixir for our skin. Regular consumption and application of grapes can give us smooth and supple skin. Sometimes, the sun is so harsh that we end up getting sunburned even if we have applied sunscreen. And sometimes, we may even forget to slather on some. No worries, nature has a solution for all problems. Grapes, surprising as it might sound, are a great home remedy for sunburns. 1. Apply the mashed grapes gently and generously on the affected area. 2. Leave it on for around 30 minutes before washing it off with cold water. The fleshy part of the grapes, as well as the extract of their seeds, contain proanthocyanidins and resveratrol that are powerful antioxidants (1), (2). The application of grape seed extract on the skin provides protection against harmful ultraviolet radiation (3). It acts as a sunscreen by reducing the redness caused due to sunburns and also minimizes the damage borne by the skin cells. Grapes also help in toning your skin and reversing the aging process. Rather that opt for chemical laden products, try using grapes. They are excellent anti-aging agents. 1. Rub the pulp on your face in a circular motion. 2. Rinse with cool water after 20 minutes. Free radicals are the main cause of premature aging. It is characterized by the appearance of wrinkles and fine lines on the skin (4). 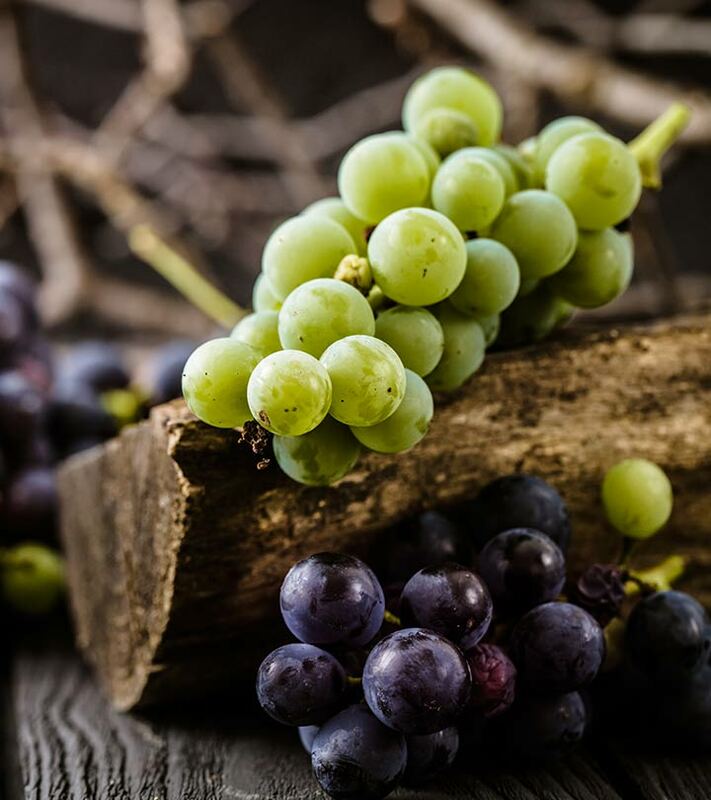 The antioxidants present in the grapes protect the skin from the harmful effects of the free radicals and reverse the appearance of wrinkles and dark spots (5). Grapes contain vitamin C that is necessary for the formation of collagen, a fiber-like protein that helps retain skin elasticity and reverses aging (6), (7). To make our skin supple and smooth, we resort to means like using baby products or spending a bomb on imported cosmetics. But, did you know that grapes are great exfoliating agents that can make your skin baby soft? You don’t ever have to spend on store-bought products again if you include grapes in your skin care regimen. 1. Use it to gently scrub your face. 2. Wash it off with cold water. Grape seed extract is rich in vitamin E and retains the moisture of the skin (8). This extract also acts as an exfoliant. Scrubbing the skin with it results in the removal of the top layer of dead cells, resulting in healthier and smoother skin. Many of us experience uneven tanning, with our face looking all patchy and discolored. But, thankfully green grapes are very effective in curing uneven skin tones. Fresh grape juice or pulp. 1. Apply freshly squeezed grape juice or pulp on your skin. 2. Let it dry. Rinse it off with cool water. 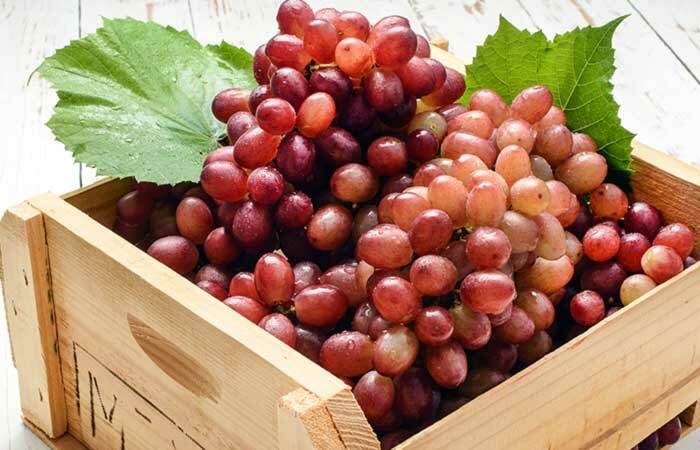 Grape pulp has been found to improve skin tone owing to the presence of polyphenols (9). So, don’t hesitate to use grape juice to even out your skin. Adolescence is a phase in which many of us get acne. However, as we grow up, they seem to disappear gradually. But, the scars never go! But don’t worry, grapes can help you lighten scars that are caused due to acne. 1. Mix all the ingredients and wrap them in a foil. Then, bake them for a quarter of an hour. 2. Apply the juice of these grapes on your face. 3. Leave it on for 15 minutes and then rinse with warm water. The vitamin C in grapes helps to repair the skin (10). With regular use, you will see the scars fade away completely. We already know that green grapes are great for curing skin troubles. But, did you know that black grapes can be amazing for your mane? Black grapes can make your hair shiny, bouncy, and strong. Let’s take a look. Seeing a bunch of hair tangled in our comb has the potential to scare us out of our wits. 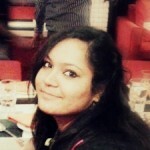 Especially during monsoons, where hair fall seems to be as common as the rain. To stop this breakage, use grapes. It is extremely beneficial in combating hair loss. 1. Mash the grapes and generously apply to your hair. 2. Let it stay for some time before rinsing it off. Linoleic acid present in grapes and grape seed oil strengthens the follicles and makes the hair strong and healthy (11), (12). Is constant exposure to the sun leaving your hair all dry and brittle? Is your natural dark hair losing its color? If it is, then it’s about time you take up the grape juice therapy for your hair. Skin of 12-14 black grapes. 1. Grind the black grapes and leave it aside. 2. Blend the chickpea flour and fenugreek powder and make it into a paste. 3. Grind all the ingredients into a fine paste and apply to the hair as a pack. 4. Rinse the mix after 15 minutes to get beautiful and naturally dark hair. Grape seeds are known to facilitate hair volume. So, why don’t you try this easy peasy solution and get thick, gorgeous locks? 1. Take fenugreek, grape seed, and pepper and grind them until they are in their powdered form. 2. Add this powder to lukewarm oil and massage it on the scalp for 10 minutes. 4. Use it twice a week to get the best results. Black grapes can prevent scalp itchiness and stubborn dandruff. For getting instant relief from dry scalp, mash up black grapes and apply to your hair. Wash it off after 15 minutes. You will be surprised by the results. Black grape is full of vitamin E and antioxidants, making it a successful agent for preventing hair problems. It even improves the blood circulation in your scalp, keeping it healthy. Be it green grapes or black ones, all types of this amazing fruit is beneficial for our health. Let’s see what they are. Ripe grape juice is an age-old home remedy for migraine. So, next time your head feels like splitting, consume a glass of fresh grape juice. This will relieve you of the torturous pain. Having the juice early in the morning without adding water or any type of sweetener will give the best results. The antioxidants present in grapes, like riboflavin, are believed to responsible for curing a bout of migraine (13). Grapes are also helpful in enhancing the health of the brain and delaying the onset of neurodegenerative diseases like Alzheimer’s. So, consuming grapes regularly can protect you from brain disorders. The polyphenols present in grapes have been found to reduce cognitive decline associated with Alzheimer’s disease in mice, which can be replicated in humans (14). Bloating and burning in the stomach can be cured by consuming a glass of grape juice. This can also prevent dyspepsia (15). Grapes reduce stomach heat, which helps in curing indigestion. A recent study says that purple colored concord grape juice helps in preventing breast cancer. So, if you want to protect yourself from this deadly disease, make sure that you have a glass of this delicious juice (preferably unsweetened) every day. Grapes have antimutagenic and antioxidant properties that are very effective in combating all kinds of cancer, and prove to be rather effective against breast cancer (16). They say that our eyes are the mirror of our soul. So, we should take extra care of it, isn’t it? Start consuming grapes to protect this important sensory organ. Grapes are rich in lutein and zeaxanthin that are responsible for maintaining good eye health as we age (17). Do you love sugar but are scared of the danger (read diabetes) associated with it? Grapes can be an excellent option. They are sweet and extremely helpful in preventing diabetes. Just be careful with the portions though – no more than ½ a serving (12 to 15 grapes) per day. Pterostilbene is a compound present in grapes that helps to lower the sugar levels in the blood, hence preventing diabetes (18). Regular consumption of grapes can help in regulating the cholesterol levels in your blood. So, instead of mindlessly opting for products that claim to control cholesterol levels, try including grapes in your diet. The polyphenols found in grape juice, for example in concord grape juice, help lower the bad cholesterol or Low-Density Lipoprotein (LDL) levels (19). Grapes also help reduce instances of kidney diseases, including stones and other troubles associated with the organ. Grapes help to reduce the acidity of uric acid. They also eliminate the acid from the system, which results in the reduction of pressure on the kidneys (20). The monsoons and autumn are the most difficult seasons for asthma patients, owing to heavy winds and airborne allergies. Grapes are considered to have a high therapeutic value for asthma. Try consuming them this season and see the difference for yourself. Grapes have a high assimilatory power that helps in increasing the level of moisture present in the lungs and soothing spasms (21). Grapes are also known to improve the chances of a speedy recovery from viral infections like polio and herpes. 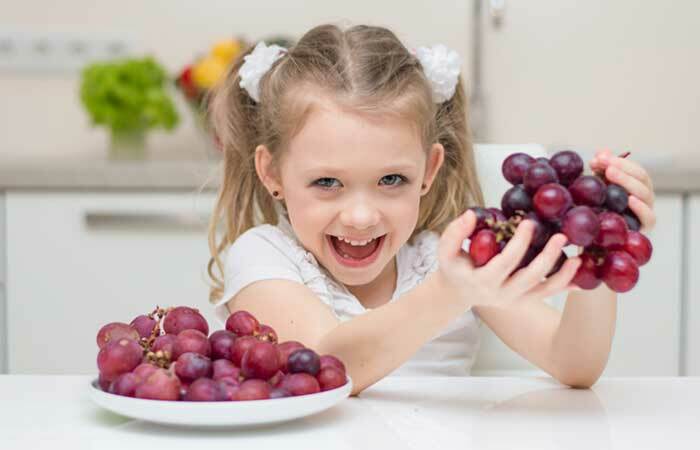 Children who consume grapes regularly have lesser chances of being inflicted by polio. Red grapes exhibit antiviral properties that protect you from various infections like the poliovirus and herpes simplex virus (22). Feeling all bloated and constipated because of the yummy spicy chicken you had last night? Have a fruit salad and include grapes for instant recovery. Grapes are very effective in curing constipation. They are thought of as a laxative food as they are rich in sugar, organic acid, and cellulose. They relieve chronic constipation by toning up the stomach (23). The quality of a product is pivotal if you are looking at reaping the maximum benefits from it. As far as grapes are concerned, always choose those fruits that are plump, unblemished, evenly colored, and firmly attached to the stem. The best way to ensure that you are buying fresh grapes is to hold the bunch by its stem and shake them. If the grapes fall from the stem, it means they have been stored for a long time and should not be eaten. Bunches are held together if the stem is green. Green or white grapes are the sweetest if they have a yellowish color with a tinge of amber while red grapes should be deeply colored with no green areas. Sometimes, grapes have a white coating on their surface. This coating, known as bloom, is a harmless, natural substance that provides protection against loss of moisture, fungus, and decay. Avoid grapes with soft or wrinkled skin or stems that are brown or brittle. This might be a sign of freezing or drying. Grapes with bleached areas around the stem or leaking berries should also be avoided as they indicate poor quality or decay. Proper storage of grapes is also a prerequisite for keeping the fruits fresh and avoiding any injury or decay. Unwashed grapes should be kept in a plastic bag or an airtight container, and stored in the coolest part of the refrigerator. Grapes can be stored for a week, but their quality diminishes with time. Serving chilled grapes on a platter with a few varieties of cheese is an easy alternative for a fancy dessert. 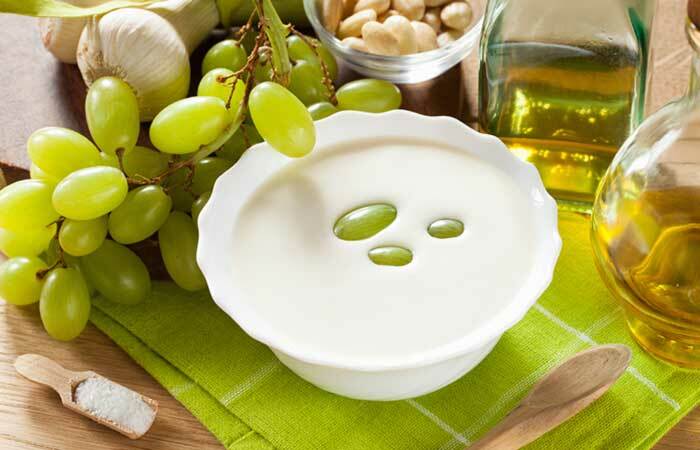 Place some red grapes in the scooped half of a green honeydew melon and top it with yogurt. Pairing this with toasted muffins makes for a nutritious breakfast. In addition to snacks, grapes can also form part of your meals. Try adding chilled grapes to pasta, chicken, sweet potato, or fish that can be served alongside crusty bread or rolls. Grapes, along with cheese, sliced sweet onions, and fresh thyme can be used as toppings on rolled puff pastry and baked. You can drop a few frozen grapes in champagne and other bubbly drinks. 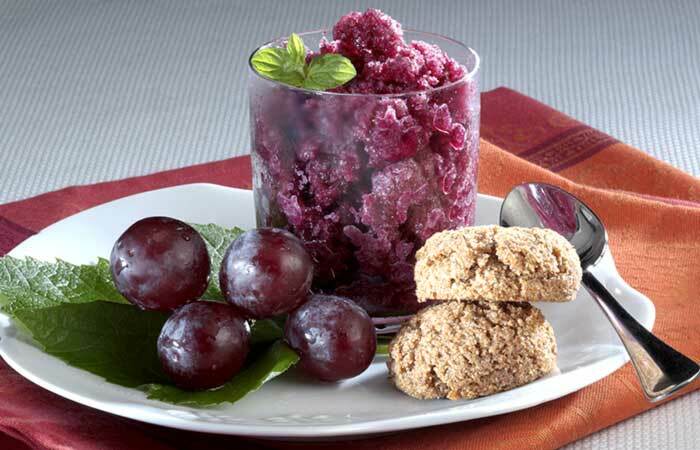 Grapes can also form part of ice creams, sodas, cocktails, and sorbets. Like many other berries, grapes can be effectively used in baked dishes such as pies, tarts, cakes, bread, and pizzas. They can be tossed with their skin in a blender to make smoothies, cocktails, and other delicious drinks. Grapes can be flavored with rich, dark, or milk chocolate to make a delicious dessert. They can be grilled or smoked and served warm, either as a garnish or for dipping. They can also be used for making pickles. Grapes, when frosted with sugar, make an elegant garnishing for cakes and desserts. They make excellent dressings for salads of all types, imparting their juicy, sweet, and tart flavor. They taste best when added as a component in salads that use citrus juices and vinegar, such as balsamic, red or white wine, rice, or apple cider. They can effectively replace tomatoes in salsa, skewers, sauces, etc., and can be grilled with meat, fish, or shrimps. 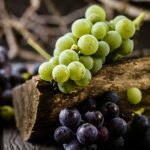 While we have come to know about the different ways in which grapes can be in food, knowing distinct and international recipes utilizing grapes can add a little twist to your party. 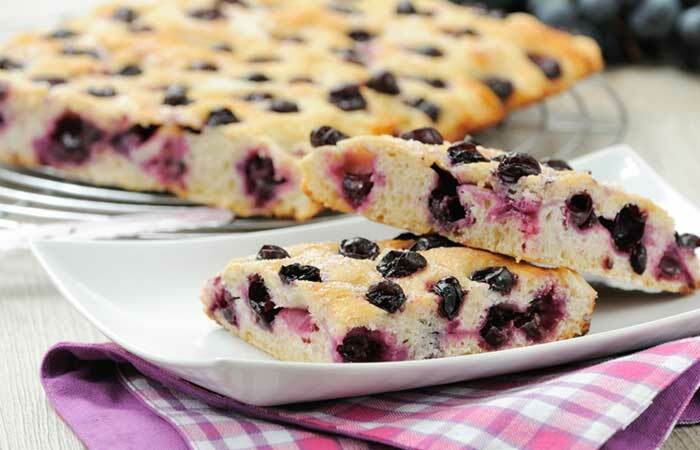 Why not begin the list with yummy focaccia? 1. Begin by heating oil in a skillet over medium hit and add 1 tablespoon rosemary. Keep on stirring. Now, remove from heat and leave the oil for cooling. 2. Take up a large bowl and add 3/4 cup of lukewarm water to it along with yeast. Let it stand until it gets foamy. 3. Add the oil-rosemary mix to the bowl along with flour, cornmeal, 3 tablespoons of sugar and salt to the yeast mix. Keep on stirring to form a soft dough. 4. Upturn the dough to a flour-based utensil and knead for 15 minutes, making it elastic and smooth. 5. Take another bowl and drizzle some olive oil on it. Toss the dough in it and coat it with oil, cover it with a cloth, and leave aside for an hour. Make sure the dough rises twice its level before going to the next step. 6. Take up grapes and cut them in half, making sure to remove the seeds. 7. Preheat oven up to 400 degrees. Now, take a cookie sheet and place it over a baking pan. Transfer the dough into it and even it out until it is half inch thick. Don’t fill the whole pan with the dough. Top up the dough with grapes and nuts and sprinkle the coarse salt. Drizzle it properly with oil and let it cook for 30 minutes. 8. Your focaccia is ready to be devoured! Another sweet dish made out of grapes that will blow your mind. 900 grams grapes (black or red) rinsed and thoroughly dried. 1. Begin by preheating the oven to 500 degrees F. Arrange the grapes on a thick baking pan. Now, roast the grapes until they are brown and crispy. This will take up around 25 minutes. 2. Remove the pan from the oven and let the grapes cool. After they are cool, blend them until they are smooth. Now, pour the puree into a bowl using a strainer. 3. Refrigerate the mixture overnight, or until it freezes properly. But, make sure to poke it every once and while. Remove from fridge and add red wine for the extra grape-y flavor. 4. Your yummy granita is all ready. Grapes are extremely versatile and nutritious fruits that can satisfy the taste buds in a variety of ways. The amount of nutrients and antioxidants that are packed in these tiny fruits are phenomenal. Therefore, we see that grapes really play a vital role in maintaining our health. If you are aware of any other benefits of grapes, feel free to share them with us in the comments section. We love to hear from you all.